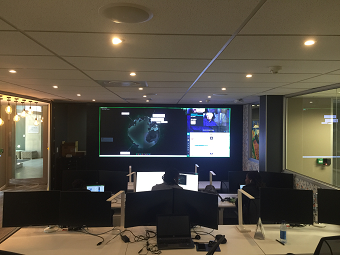 AVC was approached by a large Blue-Chip to design, install and commission a video wall for their new cyber intelligence centre which monitors cyber threats to themselves and clients they provide services for. Size of video wall according to room dimensions. Number of people in the room. Distance of furthest person away from the display. Viewing angles for each participant in the Room. Racked seating arrangements for clear viewing lines. Number and type of sources that needed to be displayed on the video wall. Video wall processor, input and output cards. 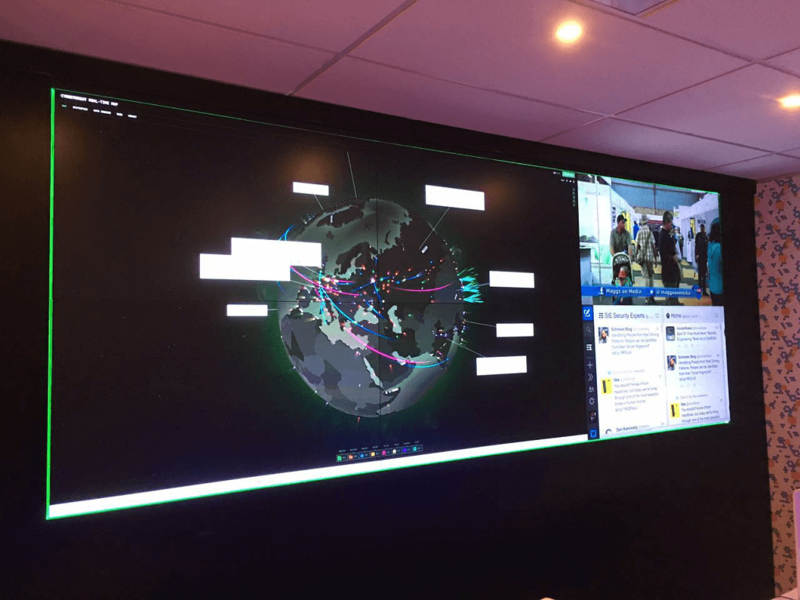 Video wall software to provide dynamic video wall layouts for the different sources that need to be displayed as well as HDCP encrypted sources. 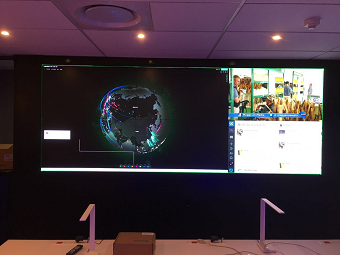 Different user accounts that allow different types access to content and format of content that can displayed on the video wall. Control systems/User interfaces that allow for changing of sources and display formats. Custom paneling surrounding the video wall that finishes off the video wall and allows access to the rear of the video wall where all display components, Video wall processor, cabling and other Infrastructure is accessible for service and maintenance. 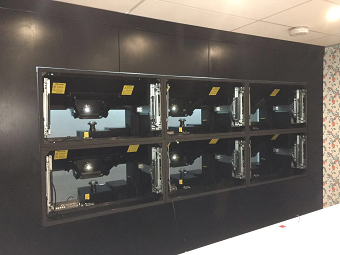 Custom built steel frames, built in AVC’s Factory to provide required height for the video wall and provide structural support of the video wall display cubes. Audio routing and mixing that allows users to select audio for a particular video source they are viewing or have selected. Incorporation of overflow capability to display selected sources in the adjoining situation room displays including the routing of the accompanying audio. 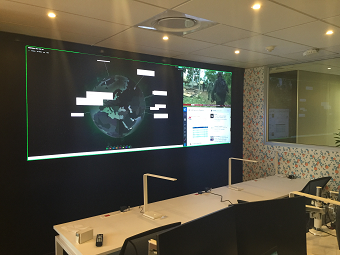 Integration of a Polycom Video Conference system with a RTV license in the situation room allowing for SIP, H.323 and Skype for business calls internally and externally with federated clients. LED RGB strip lighting to provide back-lighting around the video wall. 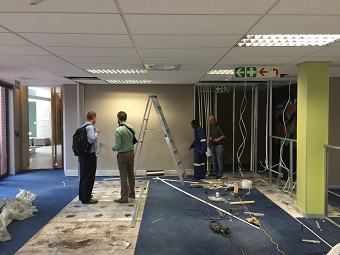 AVC, during many hours of consultation with the client, came up with a solution incorporating AV design and product selection that covered all the customers’ requirements and within their budget. Adjustment of brightness and white balance of each display so that the image on each display has uniform brightness and color. Gaining all audio levels and testing audio distribution and selection. 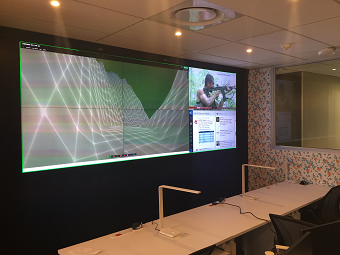 Samsung LED 65” Flat Panel displays for situation room displays.